2. 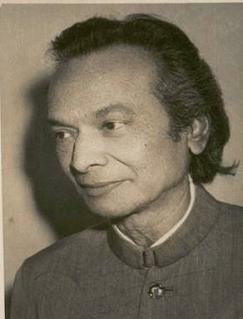 “Meri Pyari Patang” is a fascinating song in Dillagi (1949)… Musically, it’s seems a little more complicated to me than a few of the other songs on this list, but it actually works extraordinarily well – and of course it does, because it’s Naushad! It is also very interesting to hear this much heavy metaphor being thrown around in the description of a kite-flying mishap (lyrics by Shakeel Badayuni). Shamshad Begum’s voice here is as appealing and compelling as ever, and Uma Devi’s parts add even more to the listening pleasure. In fact, their singing helps “Meri Pyari Patang” to stand out just as much as any other song in this movie, and that’s saying something, because Dillagi might also be the best film for Suraiya. 1. 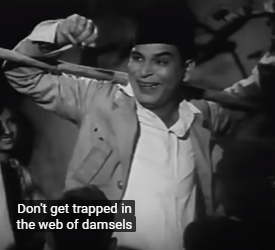 Speaking of Naushad… It could be that Shamshad Begum’s most famous number is “Door Koi Gaye…” I don’t think I could add anything about the soundtrack to Baiju Bawra (1952) that hasn’t already been said. 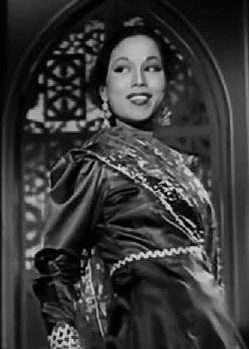 I will say that Shamshad Begum is definitely the star of this song, in quality as well as time allotted, even considering the parts sung by Lata and Rafi at their best. And as I’ve said before, whenever I hear this tune, it starts playing over and over in my head afterwards – the perfect “ear worm.” In fact, you get the perfect everything here. Absolutely brilliant! Coming up in one week, a Major Golden Age Bollywood-Related Birthday! Tina Sani is best known for singing the poems of Faiz Ahmed Faiz… And judging by these performances, I can certainy see why. Of course, I am “Urdu challenged,” but I have taken a few looks at translations of two of the poems below (i.e., the first one and the third one), and I find her voice alone to be very moving, whether or not I know the meanings of the words. She also puts on a good performance visually – she’s very expressive, conveying a lot of emotional involvement in these songs.